Patch is included in the girls cost and one vendor charges $5 extra to climb their climbing wall, one vendor charges $5 to learn and complete their Ninja Warrior parkour course, one vendor charges $5 extra to complete her ceramic project, and one vendor charges $5 extra to complete her mosaic project, and some vendors have extra things for sale. There are also food vendors selling food during the day. 1st, activities for girls to do and interesting things to see and learn about at the event, like climbing the rock wall, crossing the rope bridge, having a bubble formed around you, shoot a laser tag gun, hoop dance, walk on stilts, or get up close and personal with owls, hawks, snakes, lizards and other animals. 2nd, vendors, many with an activity or taster of the program at the event, so troops can see what they have to offer to line up future program, like River & Trails, Medieval Times, Lincoln Caverns, Laser Quest, Lasley Centre for the Performing Arts, The Adventure Park, Blu Water Scuba, and Manassas Battlefield. The activities and booths are divided loosely into different categories. We are still in the process of putting many things together and will be adding more vendors and activities up to shortly before the event. Check back often to see what has changed. To see the vendors and activities already confirmed, check the Activities & Vendors page. Booth List by Location Areas added to the Activities & Vendors, and Maps pages. Adventure Day Site Map added to the Activities & Vendors, and Maps pages. Performance, Demo, and Participation Schedule added to the Performances page. - Pumkin Chunkin added to the Science Exploration category. - Quantico Orienting Club added to the Outdoor Adventures category. - Nova Labs added to the Science Exploration category. - Northern Virginia Lions Youth Camp added to the Outdoor Adventures category. - NROCKS added to the High Adventure Row category. - Get in the Butterfly Tent added to the Animals & Animal Organizations category. - Unusual Service Unit Events added to the Girl Scouting Adventures category. - River Riders added to the High Adventure Row category. - Women Build added to the Health & Well Being Category. - American Chestnut Foundation added to the Exploring Our Natural World category. - Astronomy added to the Science Exploration category. - American Disposals Services added to the Exploring Our Natural World category. - Backyard Beekeeping added to the Animals & Animal Organizations category. - American Society of Heating, Refrigerating and Air-Conditioning Engineers added to the Science Exploration category. - Fauquier Parks & Recreation added to the Outdoor Adventures category. - Moo Thru Ice Cream Truck as a food vendor. - Camp Horizons added to the Outdoor Adventures category. - VA Department of Forestry added to the Exploring Our Natural World category. - Medical Reserve Corps added to the Health & Well Being Category. - Theaterpalooza added to the Discovering the Arts category. - Moozey Moo & Friends added to the Animals & Animal Organizations category. - Make a Friendship Bracelet added to the Exploring Arts & Crafts category. - Camp Friendship added to the Outdoor Adventures category. - NOVA Parks added to the Outdoor Adventures category. - High Adventure in GSCNC added to the High Adventure Row category. - Kingdom of Azuria added to the Discovering the Arts category. - Girl Scouting in GSCNC added to the Girl Scout Adventures category. - Hoop Dancing added to the Health & Well Being Category. - Make a SWAP added to the Exploring Arts & Crafts category. ​- iFLY added to the High Adventure Row category. - Lasley Center for the Performing Arts added to the Discovering the Arts category. - Cedar Run Garden Club added to the Exploring Our Natural World category. - Rainforest Trust added to the Exploring Our Natural World category. - Outdoor Cooking added to the Outdoor Adventures category. - Greenhouse, Garden, & Worms added to the Exploring Our Natural World category. - Fauquier Health added to the Health & Well Being Category. - Rappahannock Electric Cooperative added to the Exploring Our Natural World category. - Bluegrass Alpaca Ranch added to the Animals & Animal Organizations category. - Cupcakes and Lace added to the Exploring Arts & Crafts category. - Virginia Herpetological Society added to the Animals & Animal Organizations category. - Fauquier Francis Garden Club added to the Exploring Our Natural World category. - Prince William Forest Park added to the Outdoor Adventures Category. - 4-H Agility Dogs added to the Animals & Animal Organizations category. - Foothills Spinners & Weaving Guild of Northern Virginia added to the Exploring Arts & Crafts category. - Sully Plantation added to the Outdoor Adventures Category. - Spirited Pottery added to the Exploring Arts & Crafts category. - Northern Virginia 4-H Educational Center added to the Outdoor Adventures Category. - Madam Tussauds added to the Discovering the Arts category. - Tommy Tomato added to the Exploring Our Natural World category. - Blu Water Scuba added to the High Adventure Row category. - Riverbend Park added to the Outdoor Adventures Category. - Children and Adults with Attention-Deficit/Hyperactivity Disorder (CHADD) added to the Health & Well Being Category. - Geocaching added to the Outdoor Adventures Category. - Good Grubbin added as a food vendor. ​- Lions Project for Canine Companions for Independence added to the Animals & Animal Organizations category. - Big Dog Pots added to the Exploring Arts & Crafts category. - Fishing added to the Outdoor Adventures category. - American Red Cross added to the Health & Well Being Category. - Aviation Ed added to the Science Exploration category. - Messicks Farm Market added to the Exploring Our Natural World category. - Prince William County Parks & Recreation added to the Outdoor Adventures category. - Washington Area Animal Adoption Group added to the Animals & Animal Organizations category. - American Water Resources Association added to the Exploring Our Natural World category. - Vertical Rock added to the High Adventure Row category. - Sobo Food Truck added to the food vendors. - Sky Zone added to the Health & Well Being Category. - Comfort Cases added to the Health & Well Being category. - Fauquier County SPCA added to the Animals and Animal Organizations category. - Fairfax Fencers added to the High Adventure Row category. - GSCNC Camps & Camping added to the Outdoor Adventures category. - Laser Quest added to the Science Exploration category. - Stilt Walking added to the Health & Well Being category. 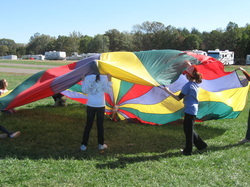 - Parachute Games added to the Health & Well Being category. - Bubblefest added to the Science Exploration category. - National Capital Lyme & Tick-Borne Disease Association added to the Exploring Our Natural World category. - Science is in the Eye of the Beholder added to the Science Exploration category. - Balance Beam added to the Science Exploration category. - Hands On Nature Collection added to the Exploring Our Natural World category. - Bev's Ceramics added to the Exploring Arts & Crafts category. - Manassas Battlefield added to the Outdoor Adventures category. - Virginia Dept. of Game & Inland Fisheries added to the Exploring Our Natural Resources category. - Sun Safety added to the Discover Health & Well Being category. - GW Nursing Students added to the Discover Health & Safety category. - Waggin' Hearts added to the Animals and Animal Organizations category. - Urban Evolution added to the Discover Health & Safety category. - Farm Animals added to the Animals & Animal Organizations category. - Medieval Times added to the Discovering the Arts category. - High Country Basketry added to the Exploring Arts & Crafts category. - Lincoln Caverns added to the Exploring Our Natural World category. - Letterboxing added to the Outdoor Adventures category. - Adventure Links added to the High Adventure Row category. - Rikkis Refuge added to the Animals & Animal Organizations category. - Sweet Virginia added to the Exploring Our Natural World category. - Prince William County Historic Preservation District added to the Outdoor Adventures category. - Fauquier County Sheriff's Department K-9's added to the Discover Health & Safety category. - Zumba added to the Discover Health & Safety category. - Blue Ribbon Catering added as a food vendor. - Fauquier County Fire & Rescue added to the Discover Health & Safety category. - FLOC Outdoor Education Center added to the High Adventure Row category. - Fauquier County Sheriff's Department added to the Discover Health & Safety category. - Penguin Paddling added to the High Adventure Row category. - Harpers Ferry Adventure Center added to the High Adventure Row category.